Jeg har tidligere skrevet om den tildels absurde narkotikapolitikken som føres i de fleste vestlige land. En politikk som ikke er basert på vitenskap, men derimot på historiske og kulturelle årsaker. Den fysiske skade rusmiddelet påførere brukeren. Evnen rusmiddelet har til å skape avhengighet. Effekten (ringvirkninger) bruk av rusmiddelet har på familier, nærmiljø og samfunn. Etter disse kriteriene er alkohol og tobakk mer skadelige enn bl.a. cannabis og ecstacy, og lovverket bør endres deretter. La meg gjenta: Den største studien noensinne utført omkring bruk og skadevirkninger av kokain konkluderte med at skadevirkningene var mindre enn ved bruk av alkohol og tobakk. At the point where mild cocaine use was described in positive tones, the Americans presumably blew some kind of outrage fuse. This report was never published, because just two months after the press briefing was released, at the 48th World Health Assembly, the US representative to WHO threatened to withdraw US funding for all their research projects and interventions unless the organisation “dissociated itself from the conclusions of the study” and cancelled the publication. According to WHO, even today, this document does not exist, (although you can read a leaked copy in full on the website of the drugs policy think tank Transform at www.tdpf.org.uk/WHOleaked.pdf ). Drugs instantiate the classic problem for evidence based social policy. It may well be that prohibition, and the inevitable distribution of drugs by criminals, gives worse results for all the outcomes we think are important, like harm to the user, harm to our communities through crime, and so on. But equally, it may well be that we will tolerate these worse outcomes, because we decide it is somehow more important that we publicly declare ourselves, as a culture, to be disapproving of drug use, and enshrine that principle in law. It’s okay to do that. You can have policies that go against your stated outcomes, for moral or political reasons: but that doesn’t mean you can hide the evidence, it simply means you must be clear that you don’t care about it. Jeg vet ikke om jeg er helt enig i dette. Jeg synes ikke det er greit å tolerere at andres mennesker skades når vi har vitenskapelig dokumentasjon som viser dette, bare fordi vi ønsker å lovfeste en signaleffekt som er i tråd med våre kulturelt betingede etikk. Narkotikapolitikk er et eksempel på et område hvor jeg mener at vitenskap i høyeste grad kan, og bør, brukes for å forme samfunnets verdier og lover. The core point is that the death and sickness and moral collapse which are associated with class A drugs are, in truth, generally the result not of the drugs themselves but of the black market on which they are sold as a result of our strategy of prohibition. In comparison, the drugs themselves are safe, and we could turn around the epidemic of illness and death and crime if only we legalised them. However, it is a contemporary heresy to say this, and so the overwhelming evidence of this war’s self-destructive futility is exiled from almost all public debate now, just as it was when those congressmen met. We cannot find any medical research from any source which will support the international governmental contention that heroin harms the body or mind of its users. Nor can we find any trace of our government or the American government or any other ever presenting or referring to any credible version of any such research. On the contrary, all of the available research agrees that, so far as harm is concerned, heroin is likely to cause some nausea and possibly severe constipation and that is all. In the words of a 1965 New York study by Dr Richard Brotman: «Medical knowledge has long since laid to rest the myth that opiates observably harm the body.» Peanut butter, cream and sugar, for example, are all far more likely to damage the health of their users. Now, move on to the allegation that heroin kills its users. The evidence is clear: you can fatally overdose on heroin. But the evidence is equally clear, that – contrary to the claims of politicians – it is not particularly easy to do so. Opiates tend to suppress breathing, and doctors who prescribe them for pain relief take advantage of this to help patients with lung problems. But the surprising truth is that, in order to use opiates to suppress breathing to the point of death, you have to exceed the normal dose to an extreme degree. Heroin is unusually safe, because – contrary to what those US congressmen were told in 1924 – the gap between a therapeutic dose and a fatal dose is unusually wide. Listen, for example, to Dr Teresa Tate, who has prescribed heroin and morphine for 25 years, first as a cancer doctor and now as medical adviser to Marie Curie Cancer Care. We asked her to compare heroin with paracetamol, legally available without prescription. She told us: «I think that most doctors would tell you that paracetamol is actually quite a dangerous drug when used in overdose; it has a fixed upper limit for its total dose in 24 hours and if you exceed that, perhaps doubling it, you can certainly put yourself at great risk of liver failure and of death, whereas with diamorphine, should you double the dose that you normally were taking, I think the consequence would be to be sleepy for a while and quite possibly not much more than that and certainly no permanent damage as a result.» Contrary to the loudly expressed view of so many politicians, this specialist of 25 years’ experience told us that when heroin is properly used by doctors, it is «a very safe drug«. Så hvor kommer da de skadene man ser på tunge heroinmisbrukere fra? 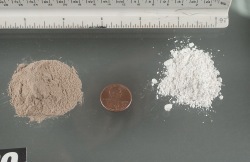 Heroin, so benign in the hands of doctors, becomes highly dangerous when it is cut by black-market dealers – with paracetamol, drain cleaner, sand, sugar, starch, powdered milk, talcum powder, coffee, brick dust, cement dust, gravy powder, face powder or curry powder. None of these adulterants was ever intended to be injected into human veins. Some of them, such as drain cleaner, are simply toxic and poison their users. Others – sand or brick dust – are carried into tiny capillaries and digital blood vessels where they form clots, cutting off the supply of blood to fingers or toes. Very rapidly, venous gangrene sets in, the tissue starts to die, the fingers or toes go black and then have only one destiny: amputation. Needless suffering – inflicted not by heroin, but by its black-market adulterants. Street buyers cannot afford to waste any heroin – and for that reason, they start to inject it, because smoking or snorting it is inefficient. The Oxford Handbook of Clinical Medicine records that a large proportion of the illness experienced by black-market heroin addicts is caused by wound infection, septicaemia, and infective endocarditis, all due to unhygienic injection technique. Street users invariably suffer abscesses, some of them of quite terrifying size, from injecting with infected needles or drugs. Those who inject repeatedly into the same veins or arteries will suffer aneurisms – the walls of the artery will weaken and bulge; sometimes they will start to leak blood under the skin; sometimes, these weakened arteries will become infected by a dirty needle and rupture the skin, leaving the user to bleed to death. I tillegg har vi dødelige sykdommer som AIDS og hepatitt-C som har smittet hundretusener av narkomane gjennom bruk av urene sprøyter. Igjen en konsekvens av den narkotikapolitikk som føres. Ytterligere et resultat av dette er at brukere er tvunget til å kjøpe heroin på «det illegale markedet» uten å ha noen mulighet til å vite renheten av stoffet de kjøper. Dette kan variere alt fra 20% til 90%, og en bruker kan derfor risikere å sette en dose som er tre eller fire ganger sterkere enn de egentlig ønsket. Med de fatale konsekvenser det kan ha. I mangel av god tilgang på stoffet, ender de ofte også opp med å blande ulike stoffer/medikamenter eller innta store mengder alkohol for å kompensere, og det er også svært farlig. In the same way, the classic signs of social exclusion among addicts are the product not of their drug but of the illegality of the drug. If addicts fail to work, it is not because heroin has made them work-shy, but because they spend every waking minute of the day hustling. If addicts break the law, it is not because the drug has corrupted their morality, but because they are forced to steal to pay black-market prices. If addicts are thin, it is not because the drug has stripped away their flesh, but because they spend every last cent on their habit and have nothing left for food. Over and over again, it is the black market, which has been created by the politicians, which does the damage. The confusion between the effect of the drug and the effect of the black market is exacerbated not only because of government policy but also because government statistics completely ignore this distinction, with the result that teams of researchers study drug policy, use compromised statistics and simply recycle the confusion, thus providing politicians with yet more false fuel for their fire. Home Office figures on drug deaths, for example, are hopelessly compromised. Eighteen months ago, the Department of Health, which might have been expected to know better, produced new guidelines for doctors dealing with drug users and recorded the following: «Generally there is a greater prevalence of certain illnesses among the drug misusing population, including viral hepatitis, bacterial endocarditis, HIV, tuberculosis, septicaemia, pneumonia, deep vein thrombosis, pulmonary emboli, abscesses and dental disease.» All of it true of the black market. None of it true of the drug. No attempt to make the distinction. Fordi disse stoffene er forbudte, får vi også en enorm kriminalitet i kjølvannet av dette. Beregninger viser at en svært stor prosentandel av all kriminalitet har sitt utspring i narkomane som stjeler for å skaffe penger til å finansiere sitt narkotikamisbruk. Når stoffene er ulovlige økes også markedsverdien av dem, og det er enorme pengersummer i omløp. Dette medfører at spredningen av narkotika øker vanvittig. Fordi det er så profitabelt, går selgerne aktivt ut og oppsøker nye potensielle brukere og skaper på den måten nye avhengige kjøpere. The Health Education Authority in 1995 found that 70% of people aged between 11 and 35 had been offered drugs at some time. Pushers push. When Britain began to impose prohibition of heroin, in 1968, there were fewer then 500 heroin addicts in Britain – a few jazz musicians, some poets, some Soho Chinese. Now, the Home Office says there may be as many as 500,000. This is pyramid selling at its most brilliantly effective. Den største ironien i myndighetenes kamp mot narkotika er at hvis de faktisk lykkes med å redusere tilgangen til disse narkotiske stoffene, så ville problemene bare bli enda verre. Mindre heroin i omløp vil føre til høyere priser på stoffet. Ingenting tyder på at misbrukere vil redusere sitt forbruk etter hva de har råd til, så med dårligere tilgang på heroin vil de måtte utføre enda mer kriminalitet for å klare å finansiere sitt forbruk. I tillegg ville selgerne måtte blande ut heroinen med enda mer farlige stoffer, noe som ville føre til flere helseskader for misbrukerne. Så hva skal vi gjøre? Det er et svært vanskelig spørsmål. Jeg mener at disse narkotiske stoffene burde legaliseres, men reguleres kraftig. På den måten ville vi sparke bena under det svarte markedet som er årsaken til kriminaliteten, og samtidig fjerne den store helserisikoen som et ukontrollert illegalt marked medfører. For example, nicotine is obviously an addictive drug, but as a reinforcer, it comes nowhere near to being as powerful as heroin. But ask people who used to be addicted to both nicotine and heroin, and they will tell you that quitting smoking was harder. Why is this? Because you can buy cigarettes at every convenience store and gas station–it’s incredibly easy to buy a carton on impulse. Because there are ads for cigarettes on billboards and in magazines, reminding smokers of their need (associative cues, which trigger drug craving). Because there is relatively little social stigma attached to smoking, and thus, less pressure to quit. All of these things are consequences of tobacco being legal. Decriminalizing cocaine would have the effect of making it more addictive than it already is. I used to support full decriminalization. These days, I have my doubts. I still don’t think we should be punishing end-users. But full decriminalization of highly-addictive drugs (heroin, cocaine, and methamphetamine fall into this category) seems to me like it would cause more harm than good. Stoffene er neppe helt ufarlige, og avhengighet er i seg selv en forferdelig lidelse. Men målt opp mot de problemer et totalforbud medfører, henger ikke dagens narkotikapolitikk på greip. Legalisering av disse stoffene handler om å la myndighetene ta kontrollen over hvordan de omsettes, på samme måte som med legemidler. Å legalisere er det motsatte av å gjøre det fritt tilgjegelig. Det er nemlig fritt tilgjengelig i dag, noe en kort tur i Oslo fort vil vise deg. Man kan ikke gå mange skrittene utenfor Oslo S før man får tilbud om litt av hvert. Ved å legalisere vil man både kunne kontrollere stoffenes omsetning, gjøre de tryggere å bruke og samtidig fjerne enorme problemer både innenfor helse og kriminalitet. There is room for debate about detail. Should we supply legalised drugs through GPs or specialist clinics or pharmacists? Should we continue to supply opiate substitutes, such as methadone, as well as heroin? Should the supply be entirely free of charge to guarantee the extinction of the black market? How would we use the hundreds of millions of pounds which would be released by the «peace dividend»? But, if we have any compassion for our drug users, if we have any intention of tackling the causes of crime, if we have any honesty left in our body politic, there is no longer any room for debate about the principle. Continue the war against drugs? Just say no. Loven er ikke lik for alle – fjern rasismeparagrafen!